page_hash : Hash表, 避免查询的时候全量扫描LRU，可以通过space id和page no获取对应的Page, 用于Buffer Pool的Block定位. 将该Block加入LRU_list的LRU_young部分buf_page_make_young_if_needed(). 这里引入了时间的限制, 即假如第二次的访问时间必须超过buf_LRU_old_threshold_ms才会将其移动到 young 部分. buf_pool_get(page_id)通过page id获取所对应的Buffer Pool的Instance. Instance与Page的对应关系很简单: page_number >> 6然后求模: % srv_buf_pool_instances. 假如Page在LRU链表中处于 old 的部分，需要将其加至 young 部分. 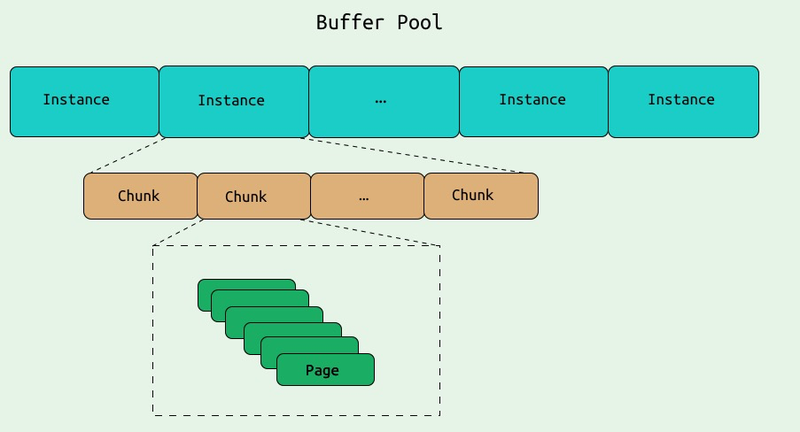 buf_page_init_for_read()调用buf_page_init()在Buffer Pool中初始化一个Page, 将该Block加至 old 部分. BUF_FLUSH_LIST: buf_do_flush_list_batch()遍历buf_pool->flush_list, 假如设置了srv_flush_neighbors=1即检查该Page的相邻的页是否允许Flush, 之后通过buf_flush_ready_for_flush()选择符合Flush规则的Page进行刷盘buf_flush_page(). 使用fil_io把Page写入文件.